This teaching set aims to help eye care workers learn to recognise the eye diseases which can affect the eyes of children in their community and which may cause blindness. It explains how to begin treatment and when to refer children with eye diseases to a specialist. It ends by setting out the measures necessary for prevention of these diseases. 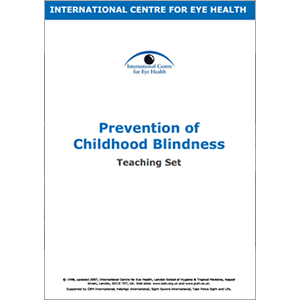 Publisher: International Centre for Eye Health, London School of Hygiene & Tropical Medicine. View photographs from this resource on Flickr.